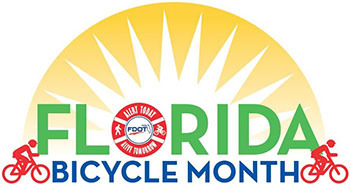 Due to generally favorable weather, the month of March is officially celebrated as Bicycle Month in Florida, although May is National Bike Month. 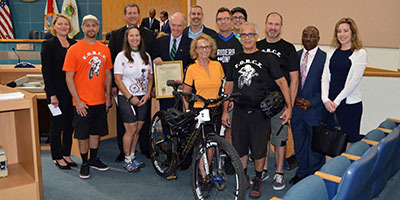 With encouragement and support from the Palm Beach TPA, multiple local governments issued official proclamations, held group bike rides, offered exhibits and presentations, and held safety training events known as "bike rodeos" for beginning cyclists. 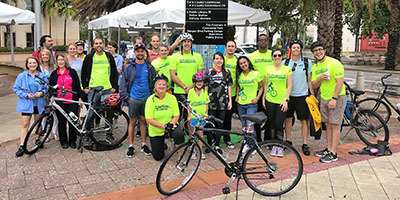 Thank you to all who participated in these activities to focus on bicycling as an important transportation mode option, and to highlight the need for complete streets to safely accommodate bicyclists, pedestrians, transit and vehicles. 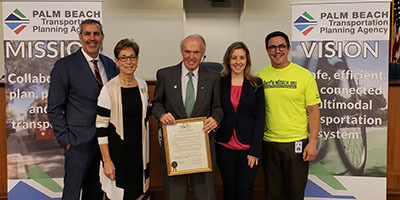 The Palm Beach Transportation Planning Agency (TPA) Governing Board issues a Bicycle Month proclamation at their meeting on March 21. Pictured above (L to R): Palm Beach Transportation Planning Agency (TPA) Executive Director Nick Uhren, TPA Vice Chair and Palm Beach Gardens Mayor Maria Marino, TPA Chair and County Commissioner Hal R. Valeche, TPA Deputy Director of Multimodal Development Valerie Neilson, and TPA Pedestrian and Bicycle Coordinator Nicholas Hernandez. The Palm Beach County Board of Commissioners issues a Bicycle Month proclamation at their meeting on March 12. Pictured above (L to R): Parks and Recreation Assistant Director Jennifer Cirillo, Ernie Deblasi, Elizabeth Hernandez, Parks and Recreation Director Eric Call, Commissioner Hal R. Valeche, Palm Beach Transportation Planning Agency (TPA) Executive Director Nick Uhren, Kathie Rielly, Rob Williams, TPA Pedestrian and Bicycle Coordinator Lead Planner Nicholas Hernandez, Stephan Pereira, Gerry Kinnard, County Engineer David Ricks, and TPA Deputy Director of Multimodal Development Valerie Neilson. 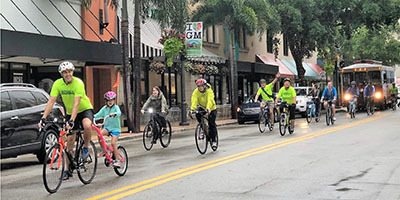 On the rainy morning of March 15, the Palm Beach TPA led a group bike ride into downtown West Palm Beach from the Mangonia Park Tri-Rail station. Other groups rode from the South Olive Community Center or from Target. Bicycle commuters gathered at the West Palm Beach City Hall courtyard on the last day of Bike-to-Work Week. West Palm Beach City Hall courtyard exhibitors included the TPA. Exhibitors talked with bike commuters and provided snacks and giveaway items focused on safety and education. 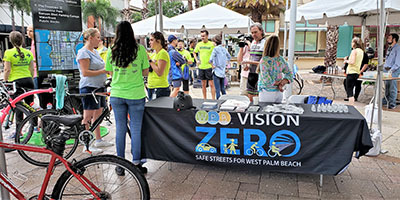 The Palm Beach TPA and the City of West Palm Beach have both committed to a Vision Zero initiative to eliminate traffic fatalities and severe injuries, while increasing safe, healthy, equitable mobility for all. 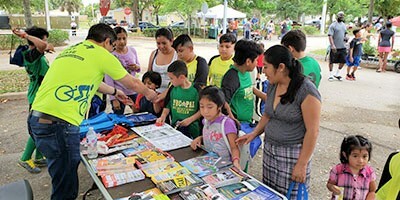 Westgate Community Center Bike Rodeo event, March 16: TPA Pedestrian and Bicycle Coordinator Nicholas Hernandez distributes educational giveaways to community residents who attended the annual bike rodeo event. 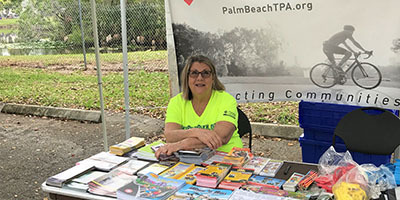 Westgate Community Center Bike Rodeo event, March 16: TPA Public Relations Manager Malissa Booth offers printed materials in both English and Spanish to promote safety for pedestrians and bicyclists. Palm Springs Bike Rodeo event, March 9: TPA Pedestrian and Bicycle Coordinator Nicholas Hernandez talks about safety with community residents. 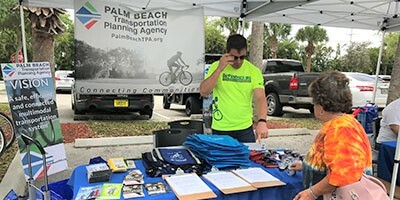 West Palm Beach, March 12: Bicycle safety presentations were among events hosted by the City of West Palm Beach as part of their annual Bike-to-Work Week held March 11-15. Presenters included TPA Pedestrian and Bicycle Coordinator Nicholas Hernandez. 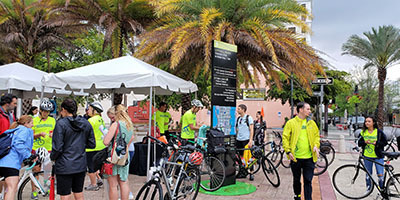 For the fifth year, the TPA will support the West Palm Beach Downtown Development Authority (DDA) which operates a free, secure #bike valet service outside a main #SunFest entrance gate at Clematis Street. Ride a bike from home, office or from a public parking facility. Other options include riding from a nearby #train station after bringing your bike on Tri-Rail or Brightline/Virgin Trains USA. Save time, stress and money as you make your way into downtown for Florida's largest music and arts festival. Click here to learn more about the Federal Certification schedule and process to evaluate the performance of the Palm Beach TPA. Learn how our region can benefit from creating a local chapter of the Congress for the New Urbanism. 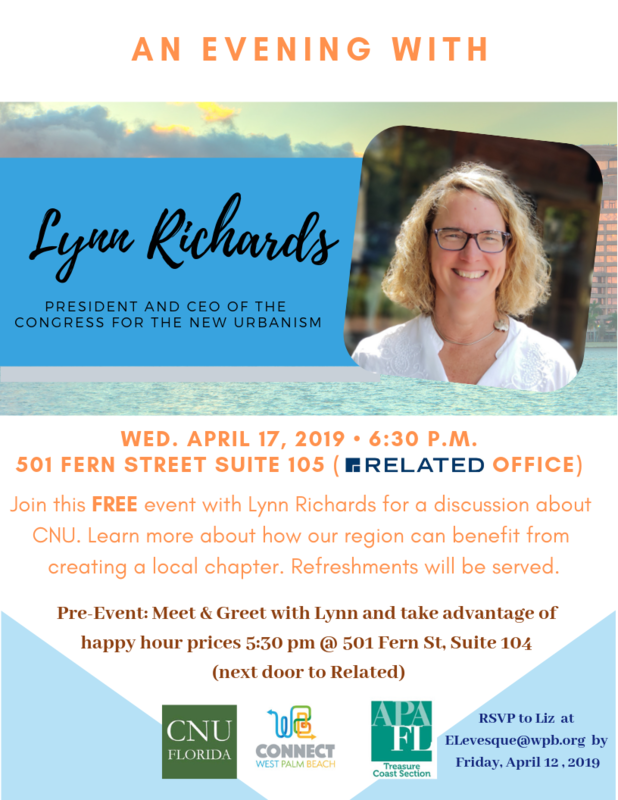 Attend a free evening event with President and CEO Lynn Richards. RSVPs are requested. Click for the event flyer. Go to PalmBeachTPA.org/Meeting to access online agendas and backup materials (posted one week in advance of each meeting), and presentations, minutes and audio recordings of past meetings of the Governing Board, advisory committees, and the Transportation Disadvantaged Local Coordinating Board. 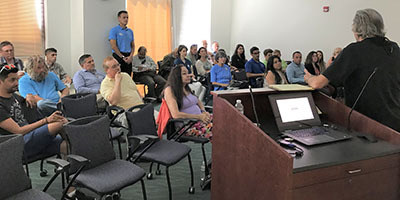 Members of the public are encouraged to attend all meetings of these Boards and committees, as well as ad hoc committee meetings or workshops publicly noticed on PalmBeachTPA.org.